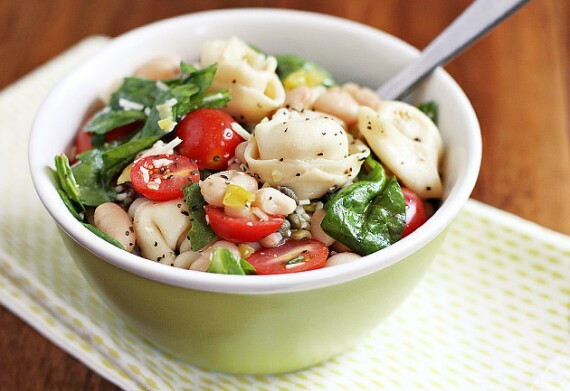 This Cheese Tortellini Salad is so ridiculously good, I’ve made it three times in a row. And I’m not a “salad and a Diet Coke” kind of girl. But I love the combination of the creamy pasta with the sweet cherry tomatoes, spicy pepperoncini and beans, because it’s delicious and full of texture, and who doesn’t have a random can of beans in the pantry? I’m pretty sure our house came with a can of pintos. The recipe calls for filling out the salad with fresh spinach, Parmesan, capers and basil, but feel free to go crazy and change it up with whatever’s handy – thinly sliced red onion, Kalamata olives, feta cheese, toasted pine nuts, kernels cut from some leftover corn-on-the-cob, diced red or green pepper, grilled veggies, chives, etc. Dress it with a little lemon juice and olive oil, and you’ve got a 200-calorie meal. That’s right, you could double-up on it, and STILL not need that Diet Coke. If your salad needs more punch (or you just feel like experimenting), toss in some thinly sliced red onion, Kalamata olives or feta cheese. Or just double the dressing. Cook the pasta according to package directions, omitting the fat. Meanwhile, combine the tomatoes, spinach, peppers, cheese, capers, basil, and beans in a large bowl. Drain pasta; rinse with cold water. Add pasta, lemon juice, and oil to the tomato mixture. Toss gently. Serve immediately.